Two thousand U.S. troops have died in Iraq. In Indiana, where I am travelling, there are some statewide rallies planned for the weekend to use the 2,000 number to call for an end to the war/occupation. I think it is important to remember our fallen troops locally as well. A memorial was held today at Worcester Common with 2,000 white crosses. Many photos at Indymedia. The photo below is from the Worcester Telegram & Gazette of yesterday’s Lincoln Square peace vigil, held weekly since 9-11-01. Time-lapse movie from City Hall webcam (WMV, 11MB, 4 minutes). Diane Rocheleau, left, of Worcester, and Jayna Turchek of Pittsburgh place white crosses on Worcester Common behind City Hall yesterday. 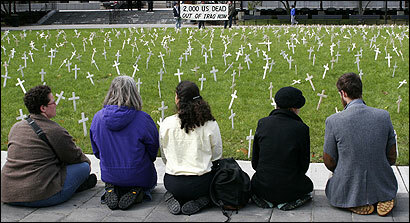 One cross was placed for each American soldier killed in Iraq. WORCESTERâ€” Sarah Loy was busy helping line up the crosses, when the man saw the creation. 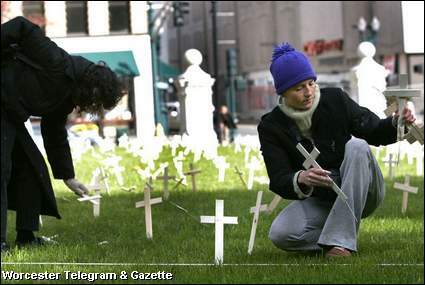 It was the point of it all, for the two-dozen activists who planted 2,000 white crosses on the fresh lawn of Worcester Common yesterday: They wanted public reaction. Each cross honored a U.S. service member killed in Iraq, and served as a visual reminder of the lives lost in the controversial war at a time when numbers are often jumbled, passed over and overlooked, the activists said. The T&G also posted a large movie file about this project.